Do you need a Miracle? Yes, this is possible! 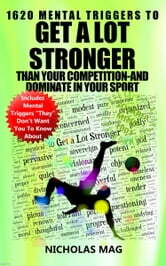 This book is specially configured (order of words) for you to Get a Lot Stronger Than Your Competition-And Dominate in Your Sport. Quick effects. Some people reported beneficial effects from the very next day. However, beneficial effects occur between 3 days and 3 months, only in very rare cases it takes a longer time (6 months - 1 year). BUT I strongly recommend you to keep reading 3 mins (at least) a day, minimum 3 months because in this way the effects are very stable. You don't need a big chunk of your time or expensive programs. In this detailed and simple book, you find all the information you need. It gives you in detail a practical, very simple, effective and successful method. This book is a practical book that has over 350 pages. This book describes in detail a practical, very simple, effective and quick-action method called Solaria Mind 1001 (NEW), that helps you to Get a Lot Stronger Than Your Competition-And Dominate in Your Sport. By reading this book, according to the given indications, you will have very rapid, positive, beneficial mental changes that will reflect in extraordinary, healthy habits and will produce real wonders in your life. This book helps you step by step, in a natural way, in just 3 minutes a day, to change your misguided way of thinking and to Get a Lot Stronger Than Your Competition-And Dominate in Your Sport. In this book, I used over 1,980 positive words with a high frequency of vibration, placed in an order that would bring a very good transformation in your life. I have also used over 1,090 positive statements structured in a way that will quickly bring you to solve your problems. I have also used in this book over 360 gorgeous images that have the role of quickly impregnating your subconscious with positive feelings and emotions, opening up your way to a quick success to Get a Lot Stronger Than Your Competition-And Dominate in Your Sport. Little Gifts of Sustainable Contentment: One-minute daily reflections for cultivating mental, emotional, physical and financial well-being. Finding and Keeping Your Crush!